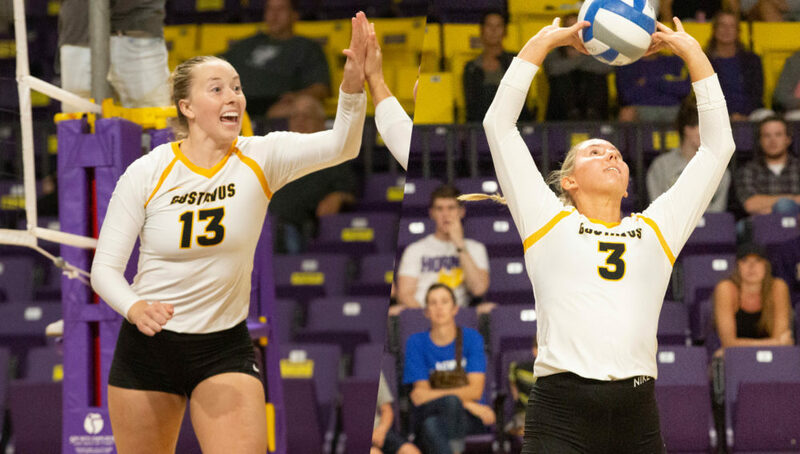 BLOOMINGTON, Minn. – Gustavus volleyball seniors Lauren Hanson (Redwood Falls, Minn.) and Nora Holtan (Rochester, Minn.) have been named MIAC Volleyball Hitter and Setter of the Week, respectively. Hanson posted a .262 attack percentage and totaled 46 kills as Gustavus won the Loras Invitational with a perfect 4-0 record over the weekend. Hanson tallied a season-high 18 kills to go along with nine blocks and a .326 hitting percentage in a 3-2 win over No. 14-ranked Northwestern-St. Paul on Saturday and in the process became just the 14th Gustie in history to reach 1,000 career kills. Holtan recorded triple-doubles in two of her four matches over the weekend, including an 11-43-14 kill-assist-dig performance against Dominican (Ill.) on Friday and a 12-53-10 showing against No. 14 Northwestern-St. Paul on Saturday. The two-time MIAC Player of the Year finished the weekend with 171 assists, 45 digs, and 33 kills for the Gusties, earning Loras Invitational All-Tournament Team honors for her efforts.